These guys are pretty scary… and they're big. 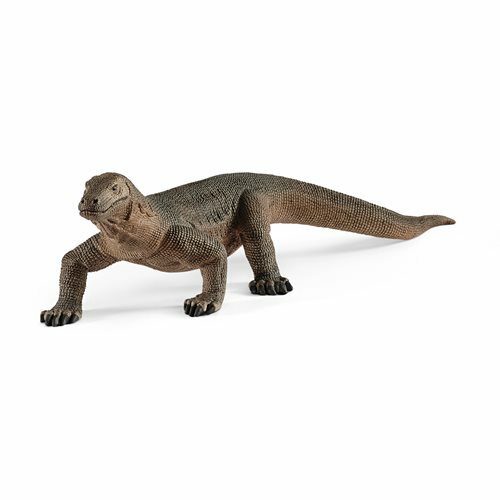 The realistic Wild Life Komodo Dragon Collectible Figure isn't nearly as large or intimidating, but it is very cool! This Komodo measures roughly 6-inches long x 1 3/4-inches tall. For even more fun, collect and play with all the finely detailed Schleich Wild Life playsets and figures. They encourage children to play and learn at the same time! Each sold separately. The Komodo dragon is the largest lizard in the world. An ambush predator, it waits in the high grass for small rodents, birds, and other reptiles. It tries to bite them with its short, sharp teeth. If it succeeds, the animals do not die because of the bite, but because of a poisonous fluid that it transmits via glands in its mouth. Kinda freaky, huh?